Every year, National Charter Schools Week gives us an opportunity to raise awareness about our amazing schools. Whether it’s the academic successes of our students, our contribution to improving the state’s K-12 system of public education, or the robust parental demand for quality schools choice that has pushed the growth of charter schools, we have a lot to celebrate and share. Charter school advocates and stakeholders across the country will celebrate the movement’s success during National Charter Schools Week, May 7-11, 2018. 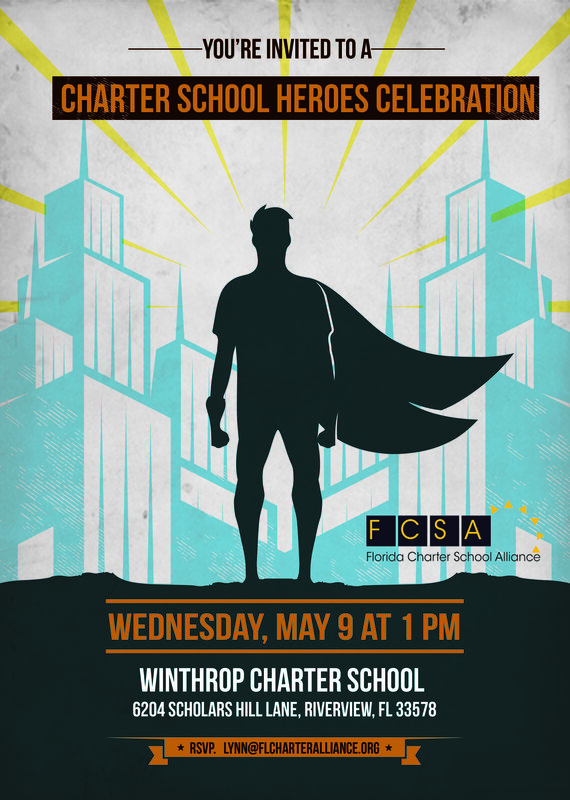 The Florida Charter Schools Alliance (FCSA) will host several Charter School Heroes Celebrations that week to recognize charter schools have had a positive impact on students, and the communities they serve. 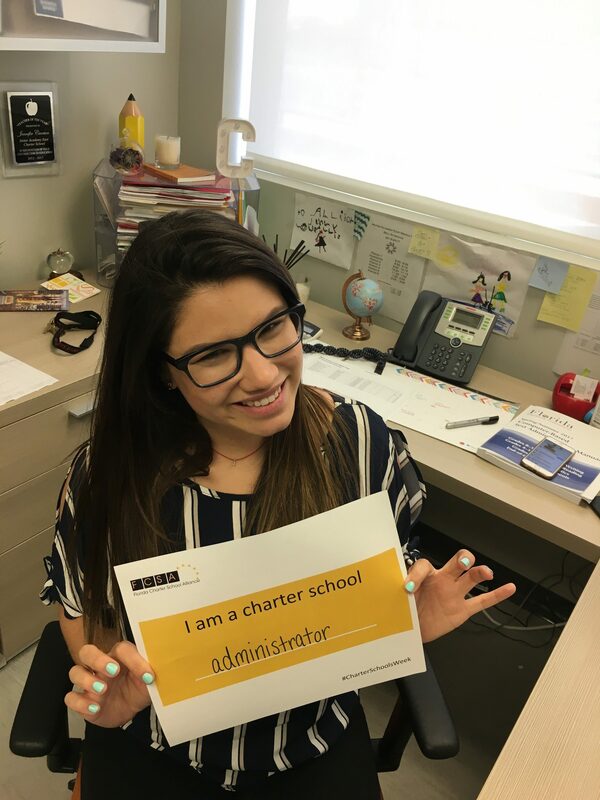 We will also highlight students that are graduating from charter schools (#30DaysofGrad) and how charter schools are helping improve Florida’s graduation rate – especially among minority students. We encourage all our member schools — their principals and governing board members — to do something to celebrate National Charter Schools Week and the wonderful work your schools do for the communities you serve. Showcase the successes of your school and students – from student gains to graduation rates, vibrant parent volunteer program to innovative programs that set your school apart from others. Demonstrate to key stakeholders (and lawmakers) that charter schools are transforming public education and the lives of children they serve . Please remember to share you stories and photos with us and use #NCSW18 when posting your stories on social media. To make it easier for you to celebrate and share your stories, we’ve created a toolkit that contains some ideas and templates that will help you plan a Charter Schools Week event and spread the word about your school. This document was adapted in part from the National Alliance of Public Charter Schools toolkit. Feel free to use the National Charter School Week logo and Charter School Fact Sheet here. Make sure to incorporate key messages about charter schools in general, and your school specifically, into all the materials you create. We recommend that you include your school’s achievement data to emphasize the successes and the unique features of your charter school and the students you serve. Consider hosting an event at your school or in the community during Charter Schools Week. Tours of your campus, with a short talk before or after by your school leader, a teacher, or your school’s parent organization leader on what makes your charter unique, and how it is serving students. Invite local business leaders, elected officials and education reporters to serve as “Principal for a Day” to get a sense of a day in the life of a charter school leader. Invite alumni to talk with students about what they’re doing now and how their charter school helped open doors for them. Present to a local community group like Kiwanis, Rotary or Chamber of Commerce about charter schools and what your school brings to the community. Hold a recognition ceremony for students, parents, teachers, and/or community officials honoring remarkable achievement or contributions. 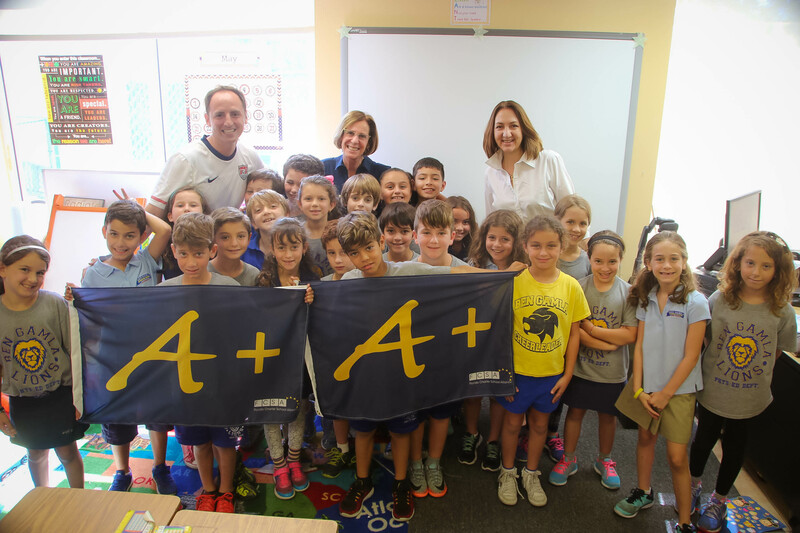 FCSA presented Ms. Sharon Miller (center) and her students with an A+ flag in recognition of their high academic achievement (National Charter School Week 2017). Elected officials at all levels of government, including School Board Members, City Council Members, state legislators, federal representatives. Your families and community partners. Media – local community and education reporters. Smaller community newspapers are usually very happy to run positive stories about local schools, but don’t forget to also send information to the large daily paper. When you have events or stories that have compelling sound or visuals, also contact broadcast (television and radio) media. FCSA can help with this outreach. Click here for Press Release template from the National Alliance for Public Charter Schools. If you are hosting an event, put together a simple Media Advisory with the 5 W’s (Who, What, When, Where, Why), on school letterhead. Be sure to include a contact name and number on the document, and send out to local education and community reporters. Write a Letter to the Editor of your local newspaper on an urgent issue facing charter schools in the community. This could be a response to an article, or an original piece. Be sure to check for guidelines in the “Opinion” section of the publication/s you may be targeting. Prepare a a one-page fact sheet for media who attend your event that highlights facts and figures about YOUR charter school. Use the FCSA fact sheet to add interesting facts about the charter school movement statewide. Identify in advance other spokespeople for your school – for example a parent or student. Have a few students designated and available for interviews with media Contact FCSA for assistance with media out reach. The FCSA has secured a NCSW18 proclamation from Governor Scott. You may request a proclamation your local government. Contact FCSA for a proclamation template. Charter school teachers, staff, students and families are the most passionate and vocal advocates for the work our schools do. Make them aware of, and get them involved in, celebrating Charter Schools Week. Run an article in your school newsletter about Charter Schools Week. Send a letter home to families thanking them for sending their children to your school and for being part of the movement. Don’t Forget Social Media! Social media is an important sharing tool that connects you to several different audiences, and allows for timely information to be released. Click here to see Suggested Social Media Posts from the National Alliance for Public Charter Schools. If you have a calendar feature on your school website, use it. Complete descriptions are also effective in letting the public know what’s going on at your school. If your school has a Facebook page, create a Facebook event for each Charter Schools Week function you hold. Encourage your school’s staff, parents and students to “share” the event on their personal Facebook pages. 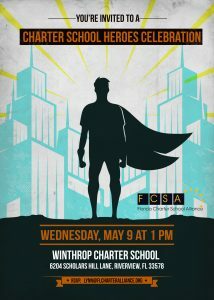 Share information about your Charter Schools Week activities with FCSA so we can add it to our social media sites. Charter Schools Week represents an opportunity to connect with supporters as well as potential supporters. But first you have to reach out. This sample letter can be used to extend a formal invite to your Charter Schools Week events. SCHOOL NAME will celebrate National Charter Schools Week on DATE with a ONE-LINE DESCRIPTION OF THE EVENT. We would be honored to have you among our guests to view the learning that occurs inside our school. You would be joining other community members and our charter school family in marking National Charter Schools Week. FURTHER DESCRIBE, IN NO MORE THAN TWO OR THREE SENTENCES, YOUR EVENT HERE. Attached you will a description of our school, students and philosophy, along with a fact sheet describing our school’s achievements and a one-page FAQs document about charter schools. We hope you will be available to attend this special community event. SCHOOL NAME students, teachers, staff and parents look forward to seeing you and showing you our school. Please contact a FCSA team member if you need assistance planning or promoting your event.